Cornerstone: The Song Of Tyrim covers all the basics of a fun title, but lacks the polish and finesse required to create a truly memorable experience. Being one of the staple names in gaming, it is unsurprising when developers take inspiration from The Legend of Zelda franchise. Cornerstone: The Song Of Tyrim is just the latest release to try and follow in The Wind Waker’s footsteps, with its focus on puzzle solving and sailing towards new adventures. You play as the Viking Tyrim, who insists on staying at home and improving his crafting skills, despite the expectation to seek out adventure on the open sea. He explains all this to his best friend, who has just come back from questing with his dad and notes that other men who have been away have not yet returned. Tyrim realizes that he misses his own father and so, decides to seek out the missing Vikings. If the choice to go after the Viking men sounds sudden, that’s because it is. There is no ‘eureka moment’ here, he just slips it into conversations straight after his speech on never wanting to leave. While it’s easy to get behind someone putting their own wants aside to save their dad, Tyrim’s facial expressions and dialogue are too blasé to ever give the impression that he actually cares. I know I don’t need an excuse to go off adventuring, but I found Tyrim going from strong resistance to killing hordes of the undead, without batting an eyelid, off-putting. Cornerstone: The Song Of Tyrim consists of 12 islands which are broken down into three sections: the tutorial island of Borja, 3 nearby islands (Dune, Himama, Rockwell), and 4 remote islands (Himalu, Mokaga, Gou-Hai, The Veil). 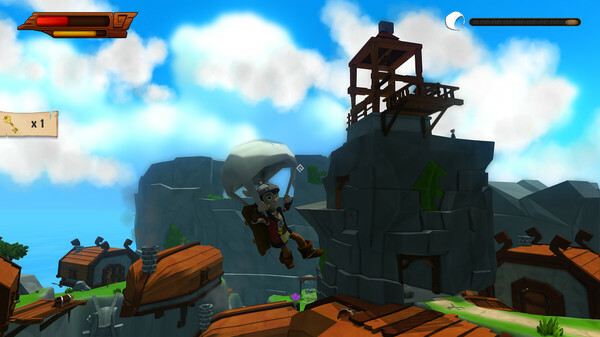 Borja’s main quest line focuses on finding a way off the island. Along the way, you’ll be given the ability to craft a number of useful items, such as a box to help reach high platforms and a sailcloth to float over gaps. I’d also advise checking in with all the locals before you set sail, as finishing their quests give some extra nifty blueprints. You can’t go after your dad until you have a bigger boat, which is where the three local islands come in. Each one consists of a smallish dungeon where you can gain new blueprints and spend time getting used to the controls. They all have puzzles to solve that tend to require collecting missing items through platforming skills, or making use of a bomb, sailcloth, or torch to reach the next section. There’s nothing overly taxing here, so it either makes for a pleasant playthrough, or a suitable challenge level for younger players. By this point in the game, you’ll probably have noticed that the controls aren’t quite responsive enough. This means a tiny delay between pressing a direction and Tyrim’s movement, making the platforming fiddly. Amusingly, vehicles have the opposite problem. It’s practically impossible to make tight turns due to speed, which is a cause of great frustration during the compulsory windsurfer race. The camera doesn’t help matters either and is not your friend. Instead of constantly following Tyrim’s back, you must move it manually with the mouse to see what’s ahead. Adding to this, Tyrim is constantly off-centre and slightly to the left, a camera view traditionally used for 3rd person shooters. Both issues combine to make it harder to gauge depth, making the puzzle platforming trickier than it needs to be. The final 4 islands focus on actually saving the missing Vikings. There’s still a dungeon on each island, but the environment itself becomes the main puzzle, with a bigger location and more unique style than those visited previously. 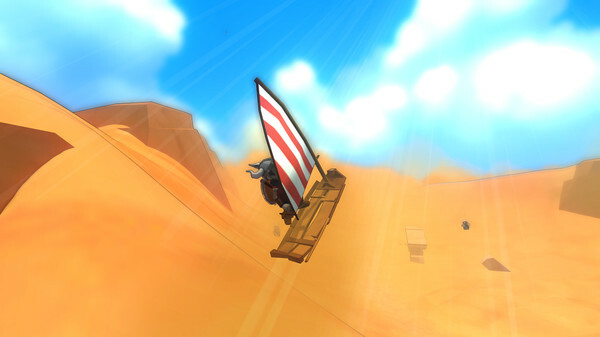 For example, Gou-Hai requires the player to sneak around delivering messages while avoiding guards, and Mokaga is a desert that needs to be navigated on a windsurfer. Exploring each island to the full is rewarded with optional dungeons and side-quests that give new blueprints and upgrades – some of which can just be found in chests or bags in secretive areas. Throughout his journey, Tyrim is unable to level-up, so you must rely on the items that you can make to solve puzzles, explore and do more damage to enemies. There are 24 crafting blueprints to find, as well as hidden upgrades for health, storage space,and crafting speed. 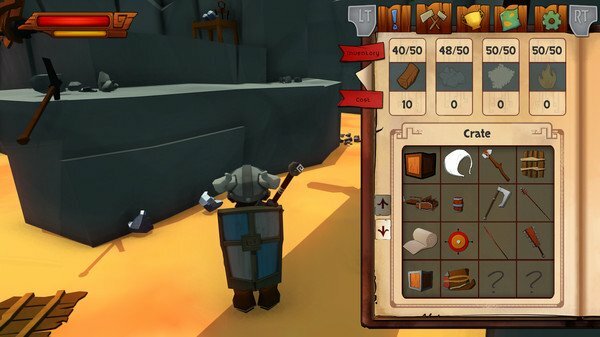 By the end of the game you can build an assortment of weapons, armour, and touches as well as some other bits and pieces. A lot of the items are pretty generic, which felt like a missed opportunity to set it apart from other crafting systems. There are some fun ones thrown in, like the boomerang, but ultimately it was disappointing that the majority ended up being melee weapons. In order to craft anything, you need the correct amount of the required materials. Tyrim is able to craft with wood, stone, wool and fire, which can be found in grass, small boxes, or just lying around the environment. It’s never really possible to get stuck if you run out of materials because there are items within arm’s reach at all times. The game doesn’t stop while you are crafting either, and since you can only hold one weapon at a time, it’s important to check on its durability before a fight. The combat itself is pretty simple, with only a basic attack, block and roll to think about. You’re never bombarded by enemies, and most will just follow and attack you, although there are a few exceptions to this pattern. It’s a shame that exclusive enemies to particular islands don’t really occur, as it would have kept the pacing fresh. To be fair, however, the four big islands do attempt some variety, and even have bosses that require a certain amount of strategy. While each island has its distinctive qualities, most are limited to aesthetics alone. Again, the main effort has gone into the 4 larger islands, but they’re hampered by the similarities in enemies and puzzle designs. Immersion is further broken by the blocky quality to the general art style. There is a charm to the scenery and designs, but ultimately the minimal amount of detail stops the game from being really beautiful. 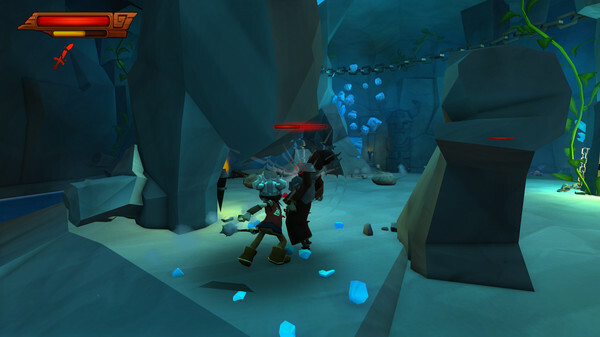 The music and sound effects suffer from similar problems as the environments, in the way that everything is pleasant but may leave you wanting more. The feeling is particularly apparent when you’re left to wonder around the world in silence for long periods of time, due to the short length of many of the music tracks. It should be noted that during my adventures with Tyrim, I did meet with a few glitches. Most had to be solved by closing the game and re-opening the save file so that blocked paths or a stuck character reset itself. While I’m sure that the developers have fixed these for the release date, I fear that some of the issues caused by the handling of the character and camera may remain the same. 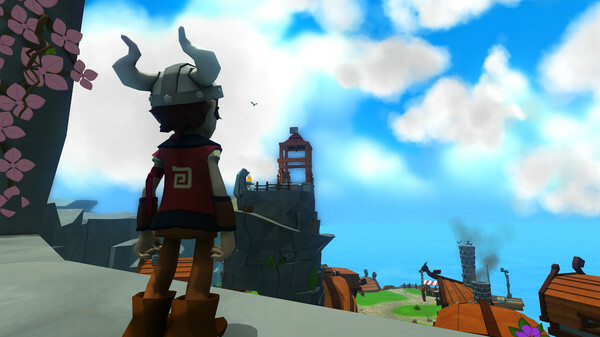 Cornerstone: The Song Of Tyrim is close to being a great title, but ultimately falls short due to a lack of polish. Improved graphics, urgency in the story, a more in-depth crafting system, and smoother controls would have all gone a long way to create a much more memorable game. Despite the negatives though, I did have fun, and as it currently stands the game can provide an enjoyable and relaxing experience. It’s just unfortunate that it doesn’t quite do enough to make it stand out from the crowd.